Application for Travel Bursary has been closed. The travel expenses will be supported to young scientists in Japan. Awardees are requested to present a poster and a short oral presentation on the first day (Sep/4/2018). They are not guaranteed and will be provided contingent upon funding availability. The registration and accommodation fees of the awardees will also be waived. 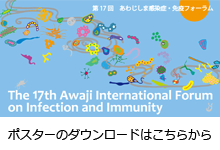 Applicants should send their CV, an abstract of their poster presentation (about 250 words including the title, names and affiliations of all authors) and a recommendation letter from the research supervisor or the department head by June 15thJune 22nd to AIFII 17 Secretariat (aifii2018@aeplan.co.jp). Application documents will be evaluated by AIFII Travel Bursary Committee, and the results will be notified to the applicant before June 25thJuly 2nd. The amount of the bursary will be approximately JPY 5,000 (e.g. Osaka) ~ 50,000 (e.g. Hokkaido). Please note that the entire travel expenses may not be covered. Accomodation will be arranged by Japan Travel Bureau (JTB) Corporation. * Applicants do not need to register, arrange accommodations, nor submit an abstract online at the time of application.